Outback Steakhouse is offering up a yummy freebie for Facebook fans! 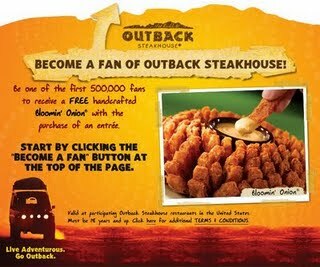 Just go here, become a fan of Outback Steakhouse on Facebook and if you’re one of the first 500,000 (should be easy to do), you’ll get a coupon for a free Bloomin’ Onion with the purchase of an entree! After becoming a fan, follow the simple instructions to snag your coupon! The coupon will arrive via email within 24 hours! The coupon may arrive in your spam email, so keep that in mind.